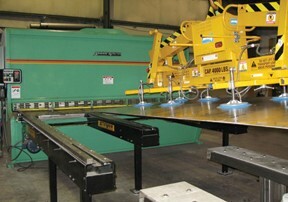 Shearing is a metal fabrication process that cuts stainless steel without the use of burning or melting. CFF Stainless Steels can shear cut sheet, plate, and stainless-steel rods anywhere from ½ inch to 12 feet in width. CFF Stainless Steel processes your stainless steel orders to fit your desired requirements by way of plate, automatic billet saw cutting and shearing.